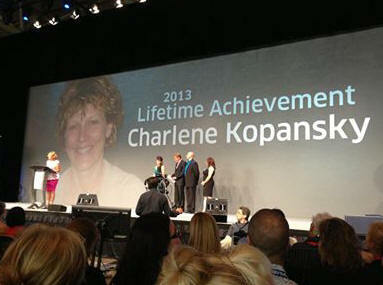 Charlene Kopansky, President and Founder, Hons. B.Sc., Human Kinetics, B.Ed. Sc., P.H.E. 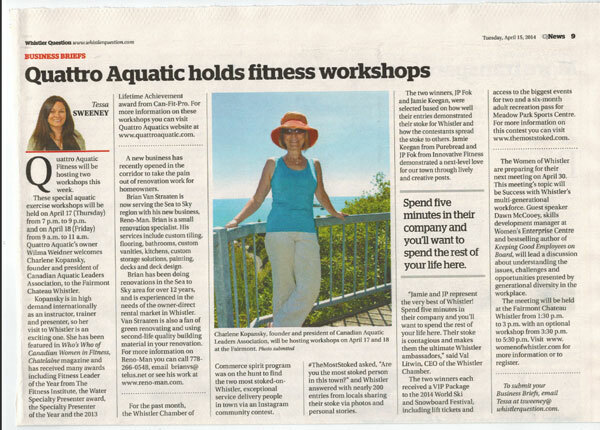 These special aquatic exercise workshops will be held on April 17 (Thursday) from 7 p.m. to 9 p.m. and on April 18 (Friday) from 9 a.m. to 11 a.m. Quattro Aquatic’s owner Wilma Weidner welcomes Charlene Kopansky, founder and president of Canadian Aquatic Leaders Association, to the Fairmont Chateau Whistler. Kopansky is in high demand internationally as an instructor, trainer and presenter, so her visit to Whistler is an exciting one. She has been featured in Who’s Who of Canadian Women in Fitness, Chatelaine magazine and has received many awards including Fitness Leader of the Year from The Fitness Institute, the Water Specialty Presenter award, the Specialty Presenter of the Year and the 2013 Lifetime Achievement award from Can-Fit-Pro. For more information on these workshops you can visit Quattro Aquatics website at www.quattroaquatic.com.